An (upgraded) open letter to Microsoft | Damian Trasler's Secret Blog - Do Not Read! ← Hey Amazon! Let’s make something NEW! You may recall my last open letter to you – more likely, you don’t. I never received any form of response. Unless, of course, the hasty cancellation of Windows 9/Blue was due entirely to my heartfelt plea to return control of the computer to the User, rather than making it simply a tool for you to impose your will upon? Thought not. I came to grips with Windows 8.1 in the end, you know, making it do as much as 7 used to. Most of my peripherals adapted or died off, and I found a way to view all the files I had stored. And when Windows 10 was announced, I was actually quite enthusiastic about the chances of interacting with Cortana, with having a PC platform that might, perhaps, make the experience of owning a Windows phone more enjoyable, or convenient. Sure, I worried a little that some of my programs (not apps, please) might not run well, but I figured I could adapt enough to counter your intransigence. There was a long wait, here in my part of British Columbia. I watched friends around the world downloading and installing, and heard various shrieks of horror or hums of approval. I still wasn’t discouraged, and when I finally got the nod (well, strictly speaking, I never ACTUALLY received notification that I could start the download – I did one of my daily checks and found it was ready…) I hit the install button with hardly a qualm. The installation took a while, but that was no surprise. I wangled my way through the menus, selecting and unselecting, reminding you again and again that you collecting my data was a choice I should be making, not one you make for me. Targeted advertising is not a benefit for me, you understand, it’s a benefit for the advertiser. I know I haven’t caught all the permissions. I know there are a bunch hidden away that allow you to do all kinds of data harvesting, and I know this because if there weren’t you would have put them all in one convenient place, instead of scattering them through settings and setup and a bunch of other places. Microsoft, you have become a politician, lying by omission and presenting a false face. That’s pretty bad, in case you hadn’t noticed. Anyway, Windows 10 works. I still have all my old emails, still have my old calendar, can still find my photos, my documents. All the programs I use on a daily basis seem to work just fine. Except for one tiny, tiny thing. When I go to save a file, the computer tells me I don;t have permission. because every day, when I turn on the computer, ALL THE FOLDERS have their permissions reset to “Read only”. Every single one. I know this because every single day I have to reset the permissions on any folder I want to use. I am the only registered user on the computer. I am, as far as I can tell, The Administrator. But every day Windows locks me out of my own folders. Why? Well, Microsoft, that’s a good question. It’s a question I’d like to ask you. Today I went back through your “Contact me” page for the hundredth time. Look, I get it. You’re just rolling out the biggest software upgrade in History. You’re trying to help everyone get on board with Windows 10 and you’d really like to weed out the ones who just want to change their lock screen back to their photo of Miggsy the Hamster, or the ones who can’t find their passwords anymore and so on. I understand why I keep getting booted back to the same FAQ screen, but I really, really want an answer to this because it is making my working day HARDER. I have upgraded the software and it is making my work more difficult. This is not how it should go. I have used Windows for a long time, and I am barely more than competent. I CAN change these permissions to use the folders. I know where to go to do that. I don’t know where to go to stop your upgraded OS from changing them back again. I don’t know why it’s doing it, I don’t know why it started, whether it will stop, or who can help me if you won’t. 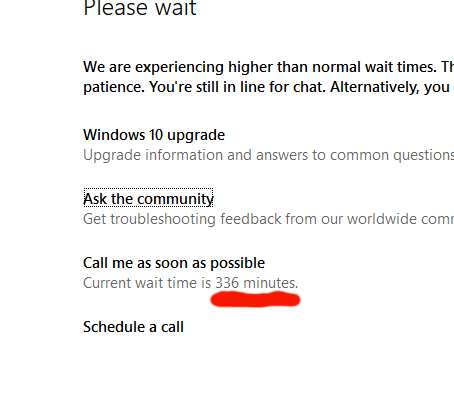 Unfortunately, I don’t ave 336 minutes to sit here and wait for your poor chat line operator to tell me he doesn’t know why that’s happening either. I’m not giving up. I’ll keep looking for a solution, and looking for a way to contact you that will actually result in contact. If you could be ready with an answer for me, that would be cool. Oh, and it would be nice if I’d known ahead of time that Cortana would NOT be available to Canada until some-undisclosed-time-in-the-future. It would definitely have affected my decision to go ahead with the install this early. I realised we’re not as technologically advanced as the Spanish or French here in BC, and our accents can make us tricky to understand. I just wonder if the folks in the Microsoft building downtown in Vancouver have Cortana as part of their Windows 10? Anyway, thanks for your time. I’m sure you’ll read this when you’re sifting through my drafts folder for information to sell to advertisers. This entry was posted in Writing and tagged Customer Service, Damian Trasler, issues, Microsoft, problems, troubles, Windows10. Bookmark the permalink. Pingback: How much would you pay for “Free”? | Damian Trasler's Secret Blog - Do Not Read! Pingback: Adventures in Tech | Damian Trasler's Secret Blog - Do Not Read!